Udupi, Mar 23, 2016 : A Green Corridor was created between Manipal and Mangaluru Ai report at Bajpe on March 22, Tuesday night for nearly 55 minutes to facilitate transport the organs of a brain dead youth from Bhatkal who had suffered extensive injuries in an accident. The youth named Purushottam Naik (30) of Talagodu in Bhatkal, a fisherman by profession had met with an accident at Mavinakurve in Bhatkal on March 14. His bike had hit against a goods rickshaw following which Purushottam had suffered head injuries. 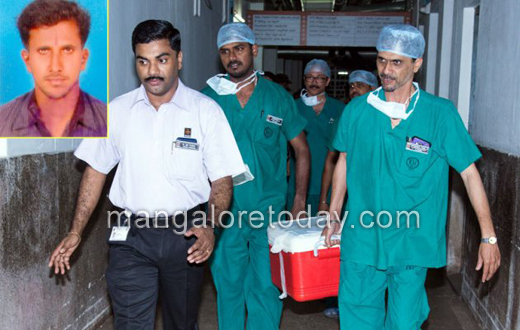 Though he was admitted to KMC Hospital in Manipal, he had slipped into coma and was declared brain dead on March 21, Monday. The family members of the youth agreed for organ donation as per the suggestion of the doctors. The eyes of Purushottam however could not be donated due to injuries. However, his kidneys, liver and heart valves have been donated and will be transplanted to a needy patient at Columbia Hospital in Bengaluru, while one of the kidneys will be transplanted to a patient in KMC Hospital and another to a patient in either in Mangaluru or Manipal. The heart valves and kidney were taken to the airport and transported to the Columbia Hospital in Bengaluru via a Jet Airways Flight. Dr M Dayananda, Medical Superintendent and Chief Operating Officer of KMC Manipal said the Hospital was happy to carry out the procedure with the active support of the administration and the Police Department. It has been learnt that the hospital has agreed to waive the pending bill of Rs 72,000 out of the total Rs 1,10,000 as per the suggestion of the DC. The deceased Purushottam was a Congress worker and has left behind his parents, five brothers and a sister. Is any financial assistance given t the family. May the almighty shower blessings on Naik’s family. Great sacrifice. A brave sacrifice by the family . May the lord give you strength and courage to over this tragedy. In spite a being painful about the son .we salute to the family of Naik for coming forward to donate the vital organs to the needy. Grateful to the family of Naik. May God Bless you people for your sacrifice.